Think of it as a pep rally for the world's premiere sporting event: the Olympics. 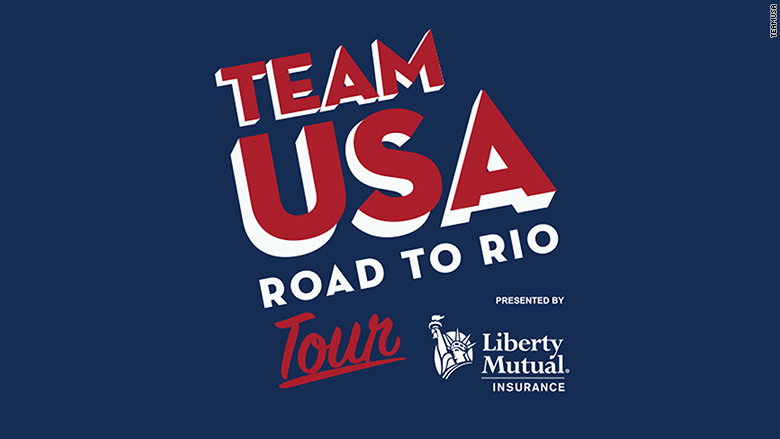 Team USA and its sponsors will kick off the 100 day countdown to the August 5 Rio games with a huge event in New York City's Times Square Wednesday. The sports spectacular will be open to the public. Fans can watch demonstrations of everything from fencing to wrestling, and will even have the chance to meet Team USA athletes and get some autographs. Also heavily featured will be the corporate sponsors that help make the games possible. AT&T (T), for instance, is the official telecommunications provider of the U.S. Olympic committee, while BP (BP) is sponsoring seven U.S. athletes. Kellogg (K) sponsors Team USA and supplies breakfast foods at the U.S. Olympic training centers, while Citi has donated $1 million to help support future athletes. Among the 75 Team USA athletes set to appear are wrestler Jordan Boroughs, a 2012 Olympic gold medalist, and David Boudia, a diver who has competed in two Olympics and took home the gold in 2012. Kelley O'Hara, who won gold at the 2012 Olympics as a midfielder on the U.S. Women's Soccer team, will be there. Also appearing will be nine "Team USA Legends," including Shawn Johnson, Shannon Miller, Rowdy Gaines and Carl Lewis. Fans will even be able to work up a sweat themselves, at least virtually. The event will let fans "participate" in beach volleyball, diving, gymnastics and pole vaulting using virtual-reality technology.